If most dance studios seems to have qualified, friendly teachers and a performance at the end of the year, are they the same? Does it really matter where you choose to study? Yes! Here are 6 main questions to ask that can make a huge difference in the quality of instruction you or your child receives and that will affect the overall enjoyment, benefits, and satisfaction of being involved with a quality dance program. Here are the questions that you, as a parent or potential student, should consider before deciding on a dance studio. 1. What type of flooring is used? The first thing to ask yourself when choosing a dance studio is on what type of dance floor will you and/or your child be learning to dance. Dance is a very physical activity that requires a lot of jumping, which can put stress on bones and joints. Most dance footwear does not provide cushioning or support, so the shock of dance movement can place a lot of pressure on the knees and back of a dancer. The best way to prevent against potential injury is by choosing a studio with a professional "air space" under its floor. Other studios may use a "floating floor" or "sprung floor"—both of which try to replicate the advantage of an "air space floor"—but don't have the same qualities and benefits of the real air space under the flooring. The top layer of the dance floor is also an important factor. A vinyl composite "Marley" floor is accepted worldwide as the best surface layer for recreational to professional dance. 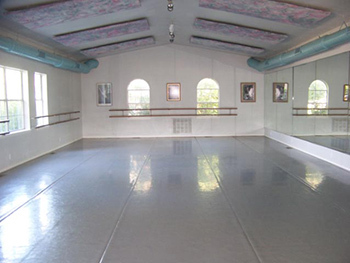 Professional companies such as the New York City Ballet and American Ballet Theatre use Marley floors as their surface. A Marley floor allows dancers to slide, with a degree of "controlled slip", but is not slippery so there is less risk of slips and falls. It also provides the optimum surface for ballet dancers to do their "pointe work" (dance on their toes). Our special "air space" surfaced by the "Marley" floor, in combination with our teachers' excellent instruction in proper ballet/dance techniques and methods help reduce the risk of injuries and allow our students to dance longer with less stress on their bodies. 2. My child wants to dance “just for fun” right now, so what is the importance of learning real ballet? For more than 40 years our school has been known for its quality training for all students. All of our students receive the same excellent training, which is presented as a fun, challenging, and creative experience! We provide a thoughtful, joyous, and nurturing environment for all of our students. Our students are living proof that ballet can provide a lifetime of healthy mind and body benefits. It is known that the benefits derived from classical ballet training exceed learning how to dance. Ballet is the foundation for all forms of dance – jazz, modern dance, ballroom, and its technique and lines are essential to gymnasts and ice skaters. But what is sometimes overlooked are the total life-long physical and mental health benefits that correct ballet training provides the individual! Our ballet classes are correctly and carefully taught, to provide concentration, mind/body coordination, beautiful posture, grace, and appreciation for all fine arts. For students who choose to pursue a career in college or professional dance, the curriculum of our school provides the opportunity of increasing the number of classes per week that the student attends, along with taking more classes that have higher technical demands. For students in their teens who desire to continue their ballet studies and yet pursue other interests, our schedule allows them to attend the minimum of 2 classes per week. 3. What is the size and length of the class? If the dance class has fewer students in it you or your each child will receive more personalized attention, learn more, and have more fun. With younger students it is easier for a teacher to maintain control over the class and make sure each student understands concepts and instructions. Our smaller class sizes make sure that no fundamental concepts are being missed. A smaller class size also allows our teachers to ensure that students are not developing bad habits or improper technique. This is very important for every dance student but absolutely vital to child students who are learning as they are growing. This individual attention, the key to careful and unhurried training, is crucial not only for the development of the student into a dancer, but for the health and safety of the student's body. The length of the class is another vital issue. For young children 6 and under, a solid 45 minutes is the limit recommended. Ages 7 through 11 – a one hour class provides a good time frame. However, for older children and more advanced adults, a proper dance class will be conducted in 75 or 90 minutes.. Our school limits our children's classes to a maximum of 12 students per class. With our pre-school classes (ages 3-4), we limit all of our classes to a maximum of 10 students per class. 4. What Kind of Recital Do You Have? Part of learning a performing art is the opportunity to be on stage. Our thorough dance training insures that our students can participate in stage productions without jeopardizing the learning process in the classroom. We believe that the end of the year Spring recital should be as child friendly and stress free as possible for all of our students and their parents. The younger dancers are allowed to sit in the audience with their parents and watch the other dancers perform. This relieves the stress of being overcrowded backstage and worrying about when it's "their turn" to perform. Our moms appreciate this too! Our younger students dance and act out "story ballets"; allowing them to learn valuable stage skills such as pantomime as well as having the fun and excitement of being part of a story with children from other classes in the school. The upper level students dance as part of a choreographed ballet; working with other classes to get the experience of being in a professionally choreographed ballet piece. The young dancers love dancing in ballets with the "big girls". Encouragement, Fun, and Low-Stress are all emphasized to allow each student to be relaxed and able to perform onstage well and have a successful and confident experience. Our "family friendly" performance lasts under two hours and a celebratory Cast Party is held after the performance for dancers and their families. Tickets are not sold for the performance and families are allowed to invite as many friends and family members as they would like to attend - at no cost to their guests. 5. Why can’t the parents stay in the classroom all the time? The children act differently when parents are in the room. When they are asked to do something new and it may seem difficult for them, they will want to cling to you rather than look forward to the new adventure. They will also look for, and react to, your approval. Having parents in the room during the class is a distraction to the children and prevents the young dancers and teacher to build the proper student/teacher rapport necessary to the child's growth in the classroom.. Parents are allowed to sit in the waiting area during class if they want to. Once the child realizes that this is a safe and fun environment, she will not need the presence of a parent. Our School has Observation Days scheduled throughout the year that allow parents and family to come observe their child's class in progress! During these designated times of observation, the viewing windows' blinds will be opened for parents and friends to observe class. 6. What are pointe shoes, and when will my daughter get them? Getting that first pair of pointe shoes (toe shoes) is what most little girls dream of when they start taking ballet classes. At our school, the teacher decides when a child is ready to "go on pointe". This decision is based on age, level of technical proficiency, muscular and skeletal development, and mental attitude and commitment of the student. Children must not be put into pointe shoes before they are ready or damage to the lower back, hips, knees, and feet can become a problem later in life. Some children decide not to go on pointe—they may love their ballet class, but choose not to make the extra physical and time commitment that pointe technique requires. We respect and support that decision—No child is pushed into going on pointe. Our school has a unique tradition for students going on pointe for the first time. We have a "field trip" to the local dance store, where the students are met by their teacher and are personally fitted by her for that first pair of shoes! There are many brands and styles of pointe shoes. Having the shoes fit the feet perfectly is invaluable to the development and health of the student. Our teachers have the expert knowledge to know which pair of shoes is just right for each girl.